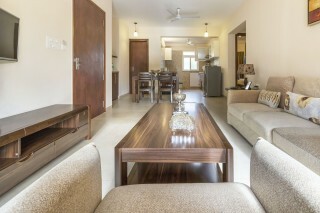 Located at a distance of 3.3 km from Calangute beach, this is an offering of a two-bedroom apartment which can accommodate up to five guests. 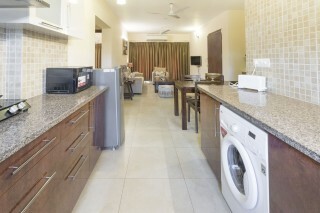 There is a fully-equipped kitchen on the property if you wish to whip up a quick meal. A shared pool on the property adds to the attraction. 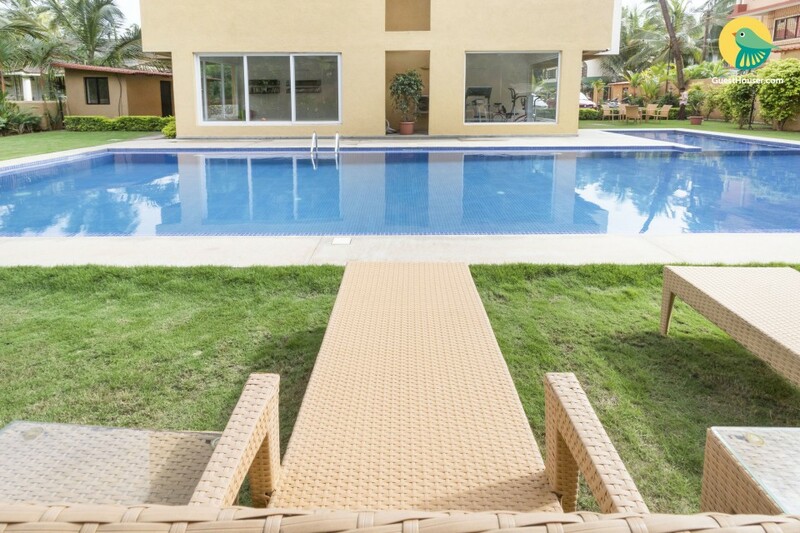 Your Space The contemporary apartment on offer boasts a perfectly manicured garden and a glistening blue pool with sun baths where you can relax after a cool dip in the pool. 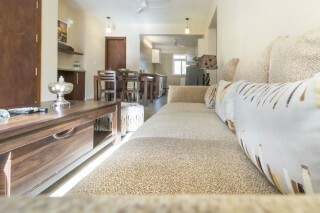 The chic interiors of the property compliment the plush settee and wooden coffee table in the living area, which is equipped with a television to keep guests entertained. The dining space houses a four-seater dinette for convenient dining. The modular kitchen is equipped with modern amenities such as a gas hob, microwave, and a toaster. There are two bedrooms on offer, while one is furnished with two single beds and a cupboard for storage, the other features a double bed and a cupboard for added convenience. 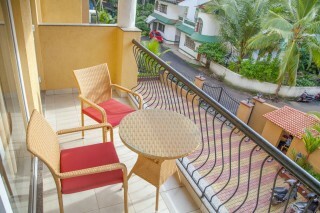 The room opens up to a balcony with a two-seater sit-out where you can enjoy a hot cuppa on a balmy evening. 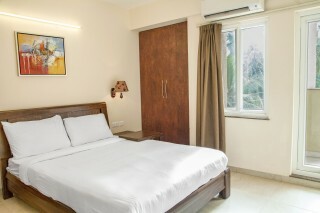 Both the rooms have attached bathrooms which are tiled and fitted with western sanitary ware. The property has an in-house gym if you’re a fitness freak! The garden area features cane sit-outs where you can enjoy your daily meals. Guests are requested to provide valid ID proof at the time of check-in. Shuttle service for the nearest beach drop to Calangute and Candolim are provided.